Our Short Term Car and Van Leasing Accounts operate on a traffic light system, this is to help us monitor your account and make sure its operating within our guidelines and that you are complying with our terms and conditions. 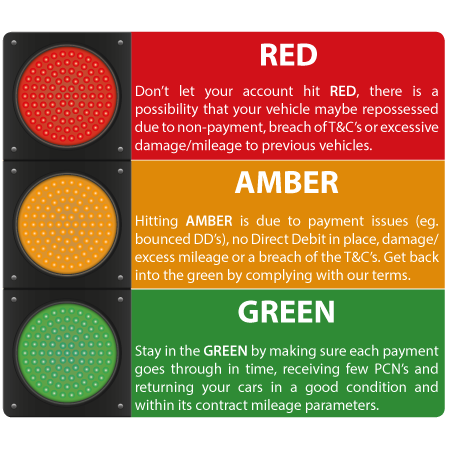 The idea is simple, if you keep your payments up to date and your vehicles are returned within the return condition parameters then you will be in the GREEN. Should you continuously bounce payments, return the cars with excessive damage or mileage or receive a high number of PCN’s, then you may go into the RED. If your account does fall into the red, then there is a possibility that your vehicle may not be renewed at the end of the contract. Should you still be in your vehicle, it may be repossessed. We are also obliged to inform our subscribed risk based systems such as Hireguard, Prohire Risk or BVRLA Risk. This may prevent you getting further cars with similar rental and short term leasing forms. If you are on one of our non-status short term leasing programs, it is really important to stay in the GREEN. If you had risk terms put in place at the beginning of the contract, they maybe repeated at renewal or if you are in the RED, your account could be cancelled altogether.